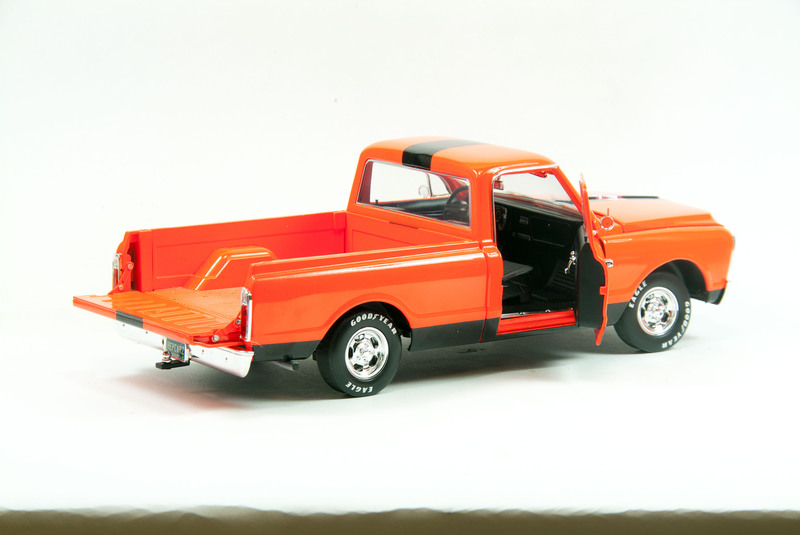 Collectors who like to create scenes for displaying their models will be thrilled by three new items from Replicarz, a 1968 Chevy C10 pickup and tandem race trailer, plus a figure of Andy Granatelli. All are sold separately, so you can create your own diorama to fit your display needs. 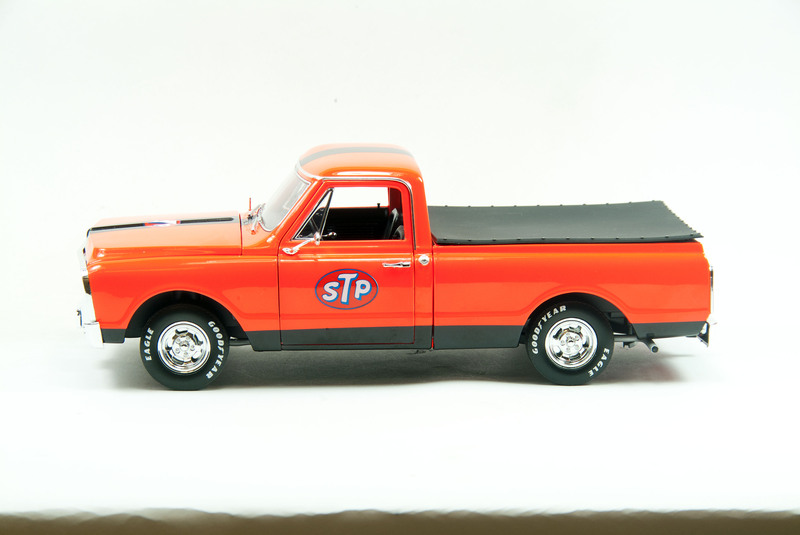 Best of all, these are all in STP trim, which means the shocking Day-Glo Orange that STP used on so many of its sponsored racers in the 1960s and 1970s. In fact, Replicarz has created at least four Indy Cars that fit the trailer and time period. There’s the new Paxton STP Turbine model, Mario Andretti’s 1969 Indy 500 winner along with the 1973 Eagles of winner Gordon Johncock and his teammate, Swede Savage. Unlike today when race teams haul their cars and other equipment to racetracks across the country in giant semi-trailers that cost hundreds of thousands of dollars, in the 1960s and 1970s, many teams still used a pickup and trailer. Some even stuck with station wagons and trailers until about 1980. 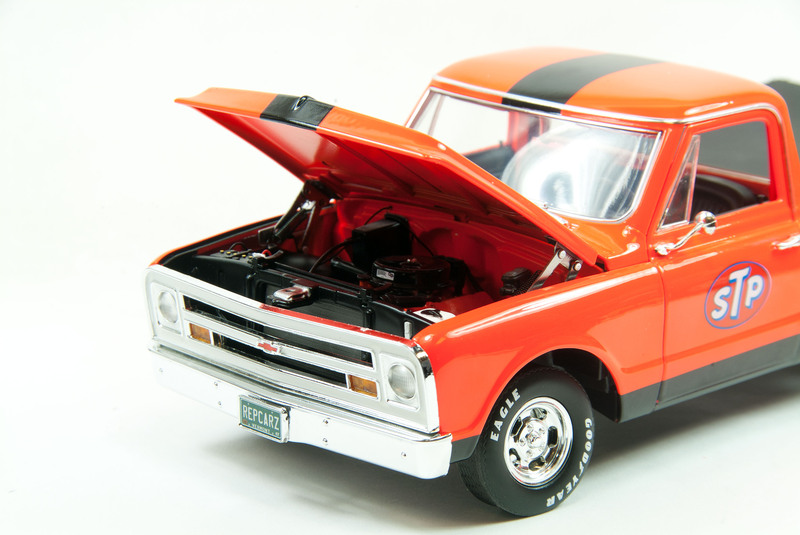 The Chevrolet C10 pickup was standard fare and would easily pull a tandem trailer and car from say, Indianapolis to Milwaukee, Wis., or Trenton, N.J. you could pile your tools and extra parts in the truck bed and put spare tires on the trailer’s front rack and be on your way. Drivers like A.J. Foyt, Andretti, Parnelli Jones, Don Branson, Eddie Sacks and Jim Hurtubise often did their own driving and towing from race to race, especially with Sprint cars and Midget racers. Here Replicarz via Acme Trading Co. for the truck and GMP for the trailer, creates STP-branded vehicles that nearly melt your eyeballs they are so bright. Put a car on the trailer and (as you see in the photo above) you have a major conversation piece. The Chevy features a metal body with opening hood, doors and tailgate and it’s beautifully executed. Naturally there’s a big V8 under the hood, with hoses, a battery, radiator and black air filter, plus realistic looking hood hinges. The truck’s nose is heavy-laden with chrome and the wiper stalks, vent windows, mirrors, door handles and gas cap are chrome. There’s also a chrome accent over the doors and across the roof’s leading edge. The underside also is well detailed with twin exhausts, one out the rear of each side, plus trailer hitch in back, naturally. Tires are labeled Goodyear Eagles. Replicarz also includes a black rubber pickup bed cover with silver snaps molded in. This complements the black racing stripe over the hood and roof. The trailer is simple and sturdy with solid steel axles and non-branded black rubber tires. The tire rack is three separate pieces that all fit together easily and will hold four to six tires, depending on their size. Flooring on the ramps is gray and there are red taillights on the wheel covers. Up front with the hitch is a hand-crank stand to steady the trailer when it’s not hooked up to a truck. So if you’d want a display with car and trailer alone this will look realistic. 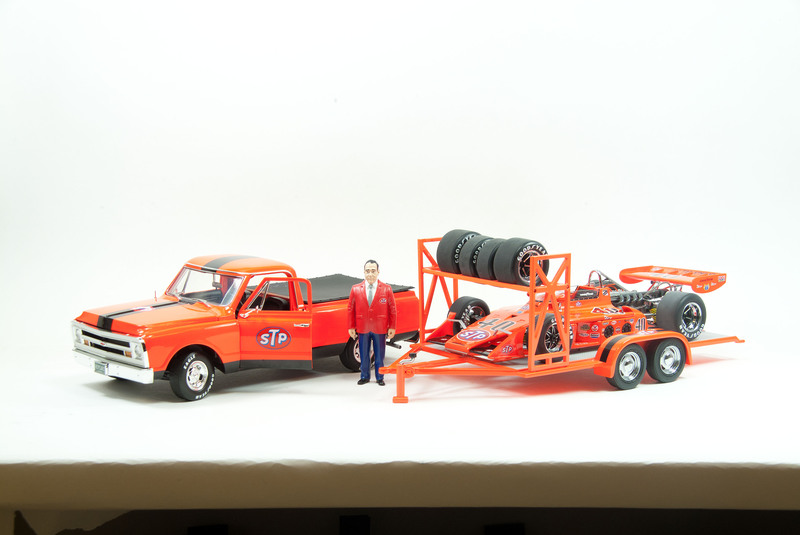 Thanks to Replicarz for including the Granatelli figure with the sample truck and trailer. 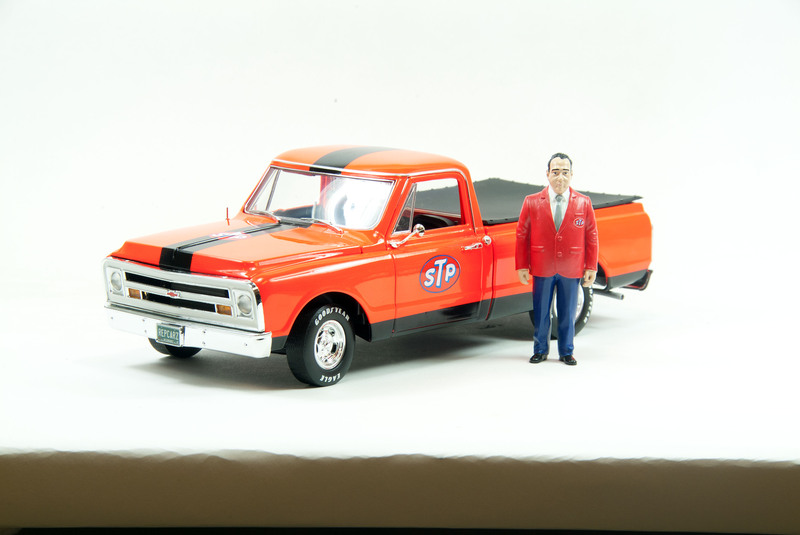 The figure costs $19.99 and represents “Mister 500” in his red STP coat and blue trousers. Granatelli and his brothers first entered a car in the Indy 500 starting in 1946 and finally won with Andretti in 1969 after nearly winning with Turbine cars in 1967 and 1968. 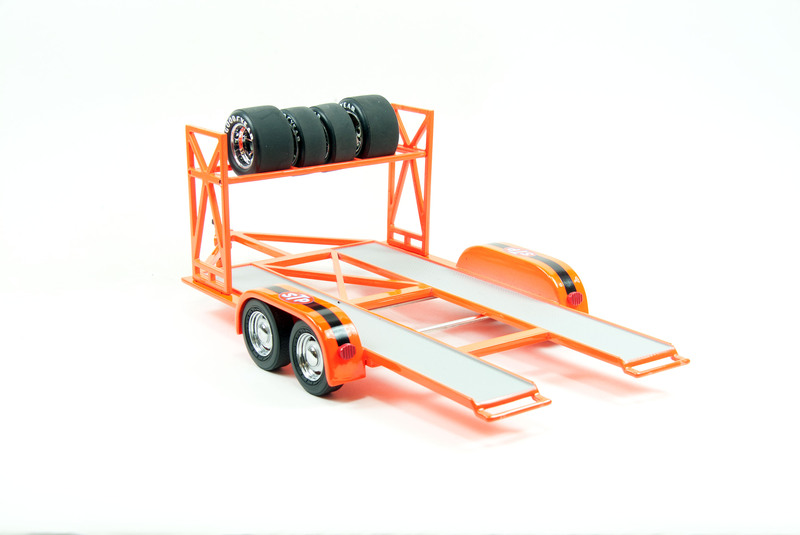 The spare racing tires seen in the photo here are not included with the trailer, but are a $14.99 item from Replicarz. They are wheels from the 1973 STP Eagles. Although not time period correct for the truck and trailer, Replicarz also offers 1980 March wheel sets.